In the News (from The Independent): “Scientists at Oxford University have made a startling discovery: they’ve found a region of the brain that makes you wonder if you’ve done something wrong, and whether you’d have been well advised to do something better. My Comment: Our world and our body is a replica of the higher worlds. The only difference is in the program of their work: for one’s own sake, in our world and for others, for the Creator, in the upper world. But all the details are identical. Question: If we establish the group like a womb for our spiritual embryo, should certain friends stand out in it? Answer: No, there cannot be anyone who stands out or who is different or unequal either in the embryo or in the group. Everyone has to be equal. It’s actually by our differences that we establish one general whole vessel: one embryo and one womb. By connecting with regard to the greatness of the attribute of bestowal, we establish one womb. It’s in the connection and the recognition of the lowliness of our nature that we establish one embryo. No one can stand out among the others, although there are parts that stand out in the embryo, since it has a human form, and the womb also has its own form. But these forms are created as a result of the sum of the connection between all of us, where everything disappears and everyone takes on the form of bestowal. Besides, the embryo is in the “waters of the womb,” which separates him from the walls of the womb. The womb is not adhered directly to the embryo, and doesn’t give its form to the embryo. The womb is Bina, which is a whole form and not a human form. But if the embryo totally wraps himself with Hassadim, he receives such bestowal from the womb that it turns him into a human being, and gives him the form of a human being, Adam, which resembles the Creator (Domeh, which has the same root in Hebrew). Question: Sometimes you accent the importance of the group and sometimes the importance of dissemination. How do we understand this correctly to actually enter the “Light”? Answer: Every person needs to receive nourishment from the upper, and together they must internalize this power they have received in order to grow. This is the next step after building a womb and an embryo; our further advancement takes place inside this internal and external system: the upper and the lower system. We turn into an old man who walks bent over and keeps making sure he has not dropped anything. And so we begin to advance our state by uncovering the faults, which we use to build and expand the higher degree. The womb becomes bigger, and now our embryo can grow bigger in it. The appeal comes from below, from the lower one, while the growth, the stages of development manifest from above, through the power of the Upper One. This is how we construct ourselves. And once we complete the nine month of prenatal development, we are born into the spiritual world, we go through the stages of the small state, reach the big state, and become ready to birth others and be to them as the upper is to the lower. We need to be in this state in relation to the world and teach the world to be an embryo inside us. Question: Is the Machsom the line where we compare our qualities to the womb and learn to feed the others? Answer: A spiritual embryo is a state above the Machsom. If I am able to connect with others and create with them a single body with the help of the Upper Light, which influences us and unites us into a single whole, then I am already above the Machsom. At this point we are already able to bestow on the minimal level, and this can only be done in the spiritual world, above the Machsom. The Machsom is the borderline, which determines whether I am still in the state of egoistic reception or whether I already possess a certain degree of bestowal. The Machsom is a kind of restriction where I cover myself to a minimal degree. And the stages of greater restriction and bestowal are built on top of this. 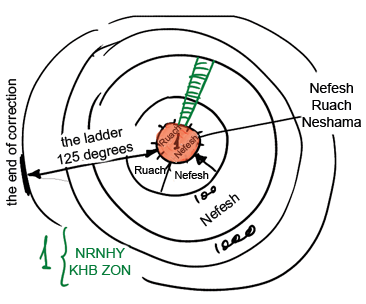 Baal HaSulam, “Introduction to The Book of Zohar”, Section 58: And I have named that commentary The Sulam (Ladder) to show that the purpose of my commentary is as the role of any ladder: if you have an attic filled abundantly, then all you need is a ladder to reach it. And then, all the bounty in the world will be in your hands. We begin our work with the construction of a group of ten people who want to become one in it. If we transform these ten people into one, then we begin to discover a higher power within them. After we finish this work, we begin to organize a more external circle. We must include all of these people with us to be able to connect again into a complete oneness. With the connection of the first level, we discover the Ohr (Light) haNefesh. And by attaining connection in a more external circle we discover Ohr haRuach. But this Ohr HaRuach is discovered in the more internal circle, while the Ohr haNefesh passes to the outer circle. If we are ready to connect an even more external circle with us, then in the more external circle, we disclose Nefesh, and in a more internal circle we disclose Ruach, and in the innermost circle we disclose Neshama. (Suppose that there were 10 people in the first circle, in the second there are 100 people and in the third 1000 people). And so on, to Haya and Yechida. It follows that our advancement depends upon expanding the external circles. Baal HaSulam called his commentary “The Ladder” because the more that we move and advance forward and include more and more new friends with us, thanks to this, we rise up the ladder and strengthen the connection between us more and more. In this way we transform into a greater Kli in which all of the Light of NRNHY are revealed in our Kelim: Keter, Hochma, Binah, Zeir Anpin, and Malchut. And then there is one Light and one Kli connected together into a single whole and we reach adherence with the goal of creation. Each one of these five levels, five circles, is divided into another five and another five, meaning that the Ohr NRNHY de NRNHY de NRNHY emerges, and in total 125 levels emerge. Therefore Baal HaSulam, making his commentary on the entire Zohar, on its entire height up to the completion of correction, explains how to rise to every spiritual level through connection of all the Kelim that will be discovered. Therefore he called his commentary, “The Ladder”. A lot has been said about The Book of Zohar lately but it is still like a drop in the ocean since how can the source of our spiritual life, the force that sustains all of reality, the expression and the revelation of the Creator to the created being, which is The Book of Zohar, be described in words? How can all the abundance, all the Upper Light that should be conveyed to all of creation through this book, all of Malchut of Infinity, the whole general soul, in order to correct and to fill it, be described in words? The Book of Zohar is actually a system that ties the Creator to all the created beings, and so we have no words to express the praise and the respect we have for it. How can small human beings like us possibly speak about this immense system of worlds that takes care of us deeply in the depths this matter. But it is precisely when we come in contact with this immense system called The Book of Zohar that we receive an awakening, feel anxiety about coming in contact with something that is very great, an exceptional source that is strong, powerful, and special. If we adapt ourselves to this system, this mechanism, this book, even a little, as much as we can, we will be rewarded with a certain level of contact with it, and through this contact, we will be rewarded with the Light that corrects us, with a medicine that will cure us, with the potion of life. In order to conform to The Book of Zohar, we need to connect together into one person. This is the first condition, but only if we are focused on the Creator. Unless this is done, we will not be arranged as one since we need the Light to connect the many particles into one whole. This one has to be focused on the Creator, to be close to Him, which means close to the force of love and bestowal. But The Book of Zohar helps us advance towards this condition even from very distant states since we actually start from zero. Just like a thermometer on the spiritual scale, there is a plus, which is above zero, and there is a minus, which is below zero. There are +125 degrees above zero and -125 degrees below zero. It is impossible to rise to plus if you don’t descend to minus of the same degree. It is actually the minus that turns into a plus. The Book of Zohar includes all the levels, all our minuses. Everything that can happen is there. “He who is greater than his friend, his egoism is even greater,” which means that he descends lower and deeper than his friend if he ascends to a higher level. The Book of Zohar can certainly help us correct all our minor transgressions, all our silly mistakes, save us, and bring us to Holiness, which means to love and bestowal. People have been trying to find something holy in material objects over the course of many years. They have unlocked pyramids and coffins and have found nothing except for mold and fungus which kills them. The fact is that people constantly rely on the material world; there is nothing good about it because it poisons a person spiritually. People build non-spiritual structures, create a world of dark objects, a world where spirituality is perceived in a material form; this is the golden calf. This is why the Torah constantly mentions a request for Moses and the Levites to rise and kill the people, to stab and burn every fifth and tenth person. This implies an aspiration to eradicate everyone’s natural, egoistic tendency to constantly search for the golden calf. There is an altruistic impulse in every person’s soul, and they must find it. But this has nothing to do with regular impulses, when a person wishes to pull away from the past, to ease his fate. Many people are prepared to die either to rid themselves of suffering or to seemingly unite with a higher idea. We see soldiers go off to war prepared to sacrifice themselves. But here the only thing a person has is his aspiration for something higher. This is a special quality of the soul, which is beginning to manifest in him. After all, the purpose of the program of creation is to bring every person to a state of similarity to the Creator, and then together we will form the single image of Adam. The Torah, “Exodus” (Ki Tissa), 32:20: Then he took the calf they had made, burned it in fire, ground it to fine powder, scattered [it] upon the surface of the water, and gave [it to] the children of Israel to drink. This can be compared to the way an antidote for a certain poison is made by a small portion of the same poison. Every medicine is poison, but not every poison is a medicine. What Moses did was the remedy for the Israeli nation. Moses did not think about destroying the nation but about curing it and about preparing a vaccination for it from the golden calf. The calf (the ego) must actually be ground to powder, so that it will lose its shape, its figure, and will be found in each one in soft power and intensity. Therefore, it’s impossible to manage without the calf. There must be poison so that everyone will know from what he could die and how to be cured. There is no punishment, but a cure. So no one should fear golden calves. The time will come when the power will be revealed, the ability and the readiness to grind the ego to powder and to start the cure on the right track. The cure for any illness is gradual and especially in this case. We should understand where we are, where we are headed, what the healing process comes down to, and most of all what it means to be healthy. This is the whole process of internal education.